As part of the celebrations to mark HRH The Prince of Wales’ 70th Birthday, BB members from across the country attended a Garden Party at Buckingham Palace to recognise and celebrate the work of his Patronage Charities. 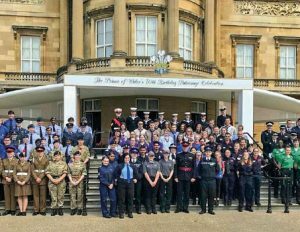 The BB members attending were part of a group of 100 young people representing the Youth United Foundation, a charity which HRH is Patron. As well as being attended by HRH The Prince of Wales, other members of the Royal Family were also present including TRH The Duke & Duchess of Sussex, on their first official engagement since their marriage the previous weekend. This was a once in a lifetime opportunity for our young people, one that they will remember for many years to come. With best wishes to HRH The Prince of Wales as he celebrates his 70th Birthday later this year.